WB result of anti-EGFR (18986-1-AP) in different cell lysates. 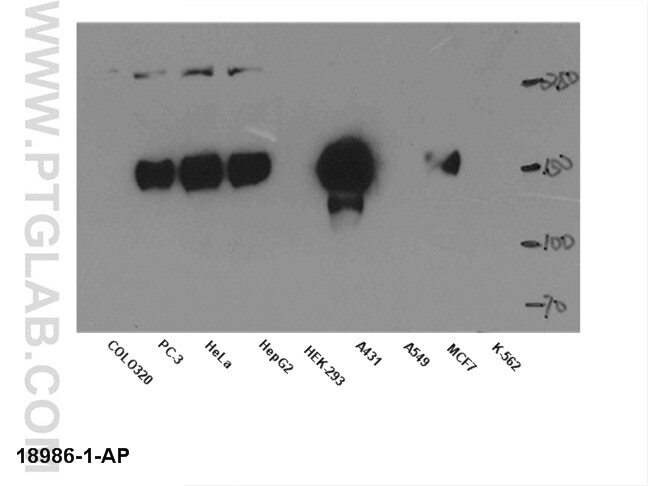 WB result ofanti-EGFR (18986-1-AP) in Hela and REP1 cell by Dr.Kodani, Andrew. 1X10^6 A431 cells were stained with .2ug EGFR-Specific antibody (18986-1-AP, red) and control antibody (blue). Fixed with 4% PFA blocked with 3% BSA (30 min). Alexa Fluor 488-conjugated AffiniPure Goat Anti-Rabbit IgG(H+L) with dilution 1:1500. 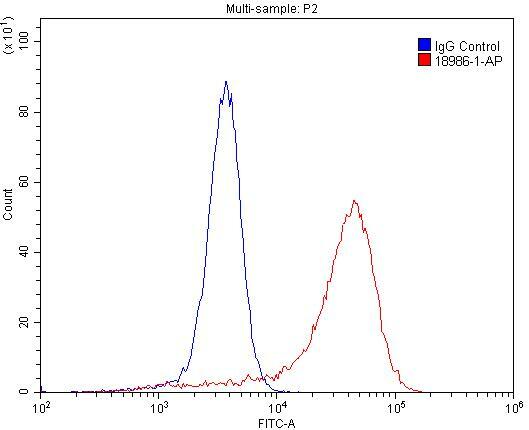 IP Result of anti-EGFR-Specific (IP:18986-1-AP, 3ug; Detection:18986-1-AP 1:500) with MCF-7 cells lysate 2500ug. 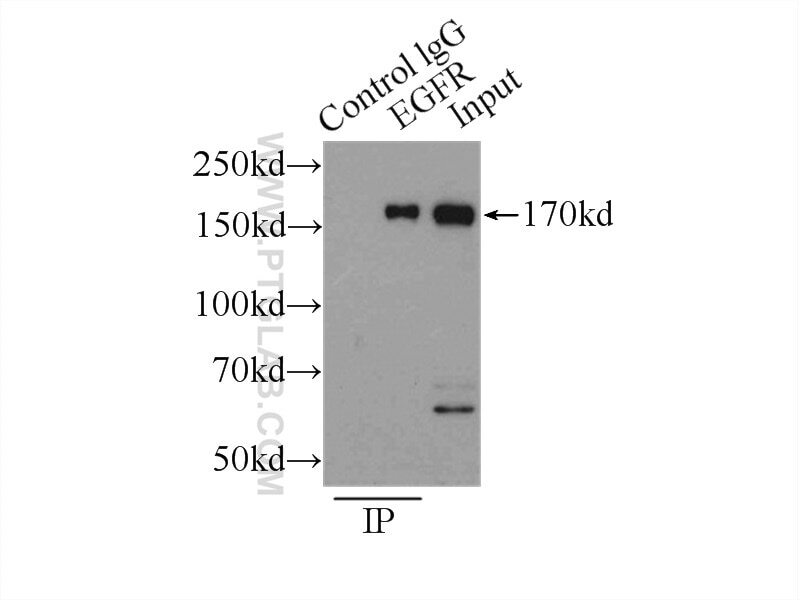 ERBB1, also mamed as EGFR, is a receptor for EGF, but also for other members of the EGF family, as TGF-alpha, amphiregulin, betacellulin, heparin-binding EGF-like growth factor, GP30 and vaccinia virus growth factor. ERBB1 is involved in the control of cell growth and differentiation. Phosphorylates MUC1 in breast cancer cells and increases the interaction of MUC1 with C-SRC and CTNNB1/beta-catenin. Isoform 2/truncated isoform of ERBB1 may act as an antagonist. EGFR is associated with lung cancer. The antibody is specific to isoform1. Histone deacetylase inhibitor trichostatin A enhances anti-tumor effects of docetaxel or erlotinib in A549 cell line. Wentilactone B from Aspergillus wentii induces apoptosis and inhibits proliferation and migration of human hepatoma SMMC-7721 cells. Attenuation of cigarette smoke-induced airway mucus production by hydrogen-rich saline in rats. miR-7 inhibits the invasion and metastasis of gastric cancer cells by suppressing epidermal growth factor receptor expression. 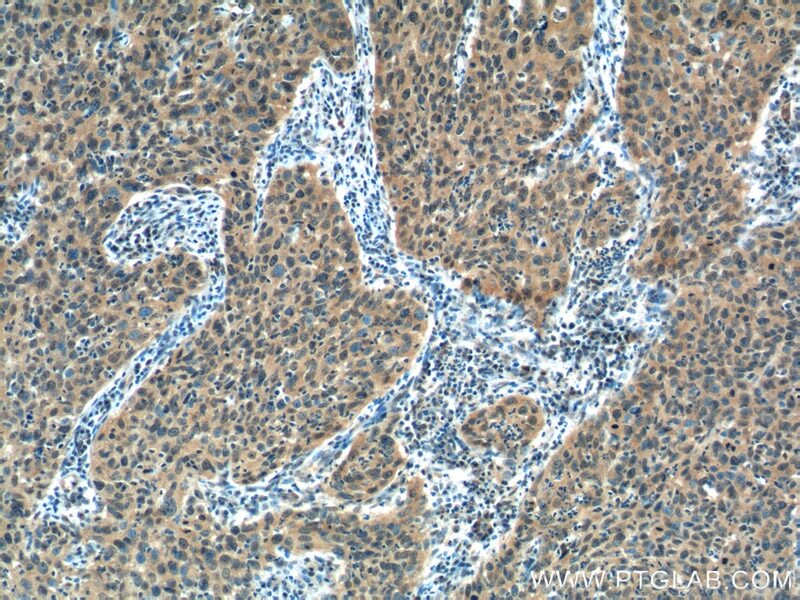 Immunohistochemical analysis of paraffin-embedded human cervical cancer tissue slide using 18986-1-AP( EGFR-Specific Antibody) at dilution of 1:200 (under 10x lens). heat mediated antigen retrieved with Tris-EDTA buffer(pH9). 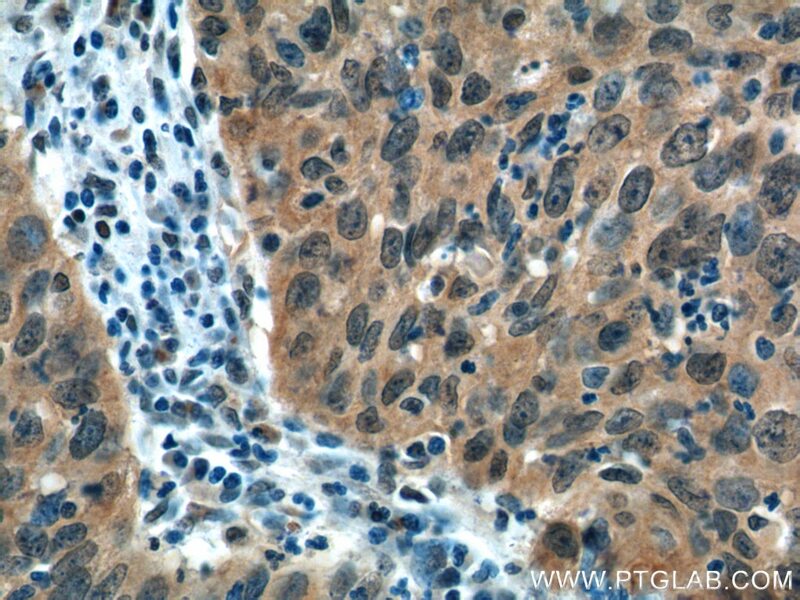 Immunohistochemical analysis of paraffin-embedded human cervical cancer tissue slide using 18986-1-AP( EGFR-Specific Antibody) at dilution of 1:200 (under 40x lens). heat mediated antigen retrieved with Tris-EDTA buffer(pH9).